Another To-Do List Template...but This One Actually Works! — Huddle, Inc.
Another To-Do List Template...but This One Actually Works! It's something that could change how you operate every hour of every day. If you don't like it and want to toss it in the pile of other things you've been given that just aren't "you” (yay… yet another turtleneck) then that's okay, too - but at least try it on first to see if it fits. Deal? This gift is something that could help you defeat those seemingly insurmountable, Goliath-like "things" that stand in the way of your success. Something that will ultimately give you freedom to function and empower you to accomplish more than you ever thought was possible. And like all truly great gifts, it’s free…and there are no strings attached. If you’re like me, you find yourself staring at your to-do list like it’s Granny’s latest batch of Everything but The Kitchen Sink Soup. Just like the ingredients in your Granny’s soup, there is no criteria for what makes it on your list and what you’re left with is a jumbled, disaster of a recipe. A hodge-podge of things “to-do” that each require vastly different amounts of energy, effort, and attention is all quite the same as Granny’s soup with confusing textures, tastes and smells. I was tired of the soup. I knew I needed to change my approach with “to-doing”, but where to start? Yeah. I Googled it (I’m a bleeding-heart millennial). And a basic search for "to-do list" yields thousands of results, hundreds of strategies, dozens of productivity templates and even a list of the "40 best to-do list apps". Who knew there were so many ways to organize a list that keeps track of the actual things you're trying to accomplish? As someone who finds himself being tasked with more and more things to do, someone who has probably tried 39 of the 40 previously mentioned productivity apps and someone who has failed miserably at finding the perfect "to-do" list system, my Google search results were more overwhelming than productive. But that’s when I stumbled across the idea of dissecting my singular “to-do list” into two lists; one classic, task-driven "to-do" list and another "to-decide" list for things that needed decisions. For those of you keeping score at home, a basic Google search for a "to-decide list" yields zero results. At first, turning one list into two didn’t sit right with me from a productivity standpoint. Leonardo da Vinci once said, “Simplicity is the ultimate sophistication.” So how could doubling my number of lists propel me forward? Is this just another recipe for disaster? The good news? At the time, nothing I was doing was working, so I decided to give it a try. 3. One side says "to-do"
4. The other says "to-decide"
Instantly I was thinking about my work differently. I had created a filter that empowered me to attack my daily responsibilities in a dramatic new way. 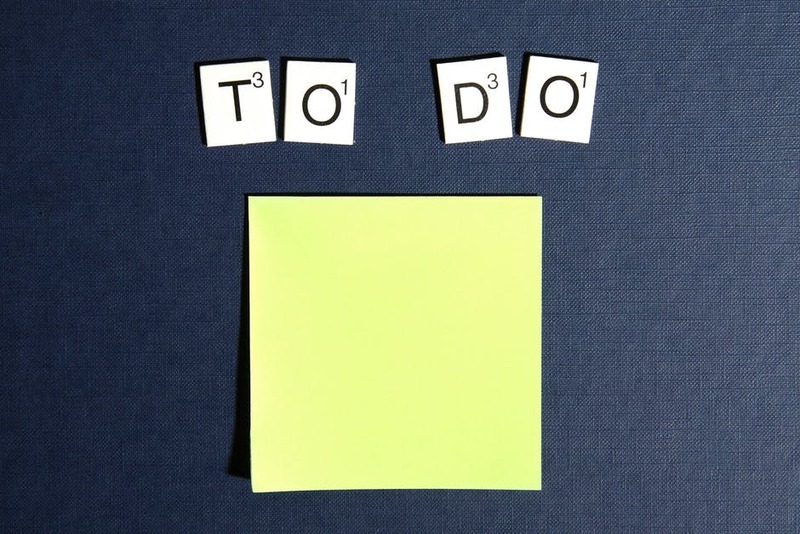 If I needed to simply do something, it made the “to-do” list (e.g., edit blog post, cold call new accounts, close out a program), and I found myself able to tackle these items in clusters and move rapidly down the list. Where I found a refreshed sense of freedom was by putting the items that weren’t as simple – the items that needed more critical thinking, processing, digesting, discussion and usually other folks in the organization – under the “to-decide” list. These are not necessarily harder tasks, they’re just a different kind of work. Ones that require contemplation, strategizing and usually a good night’s sleep. Ones that you can't accomplish in a single sitting. And by giving myself permission to compartmentalize items, I set myself free from the shackles that had held me back for so long. You can’t let the “to-decide” list become the procrastination list. Since these are usually more intensive duties, the natural tendency will be for you to let these pile up and work on the to-do list much more often. But you have to decide when you’re going to decide. So jot a date next to each item on the “to-decide” list (this part is critical). What I found is that crossing items off the “to-decide” list were much more satisfying and energizing. Like I had truly accomplished something meaningful and important. Remember earlier when you said you were going to at least try it out to see if it fit? Here are three easy steps on how you can get started. Draw a line down the middle of a piece of paper and write “to-do” at the top on the left side and “to-decide” at the top on the right side. Then do just that. And mark the item off your to-do list. Revel in the fact that you accomplished something. Congrats! But there’s still work to be done. 2. Commit to a fair period of time to pilot this new system (for some it could be a day, others a week, or others a few hours). Once you identify the pilot window, commit to the system and as things come your way place each item under the appropriate heading. My gut tells me you'll experience momentum like never before on the to-do list side, while the “to-decide” list grows a bit. Don’t forget to include a due date next to items on the “to-decide” list. 3. Write down "Does this new system work for me?" on the “to-decide” list with a date next to it for when you'll decide. And that's it. Maybe you'll discover this is practical, fits well with who you are, and makes you feel warm and fuzzy inside. And maybe you'll find that even though it's not the sexiest thing in the world, it still has a place in your wardrobe during certain seasons of your life and you want to extend this trial a bit longer. Or maybe you'll realize that turtlenecks just aren't for you – and what you found was that absence truly did make your heart grow fonder of the way you are doing things. You'll run back to your former to-do list, reinvigorated with a new passion for the perfect fit that the two of you are together. And that's okay, too - because at least you tried it on to see if it was a good fit. P.S. - Don't lose sight of the heart of a to-do/to-decide list in the first place. These are the tools to help you get things accomplished and ultimately the foundation for your plan of action. Take pride in the fact that you've got a plan, but don't stop there! These lists are simply the means to a much more fulfilling and satisfying end. Newer PostWhat is Outperforming Digital? Older PostClient Interviews...Worth Your Time?